At least once every summer, we have to have my idea of a summer cake - Strawberry Shortcake – we eat it for the whole meal!! My husband’s golf buddy, Neil, gave us wonderfully delicious home-grown strawberries every day for a week or so – the first day I hadn’t had anything planned ahead for lunch so – in a half hour or less, we had this wonderful shortcake. Yes, that's a pasta bowl! I simply take my regular baking powder biscuit recipe and make it a little sweeter and larger for the cake. This is the way we always had it as a kid and I like the biscuit shortcake the best still, warm from the oven. Sift dry ingredients together. Cut in lard until mixture resembles coarse meal or crumbs. Make a hollow in the flour-shortening mixture and stir in enough milk to make a soft dough that leaves the sides of the bowl and sticks to the mixing fork. Turn onto a lightly floured surface and knead with the heel of the hand 15 times. Roll 3/4" thick. Cut with a 3 to 4" cutter; (makes 2) place 1" apart on ungreased baking sheet. I use parchment paper. Let the dough set on the pan for 5 minutes to get a head start on rising. Then bake in very hot oven (450°) for 12-13 minutes. Split and fill with berries, top with whipped cream. Meanwhile, hull, rinse and drain your berries. I usually slice mine. Sugar them in the bowl and let set at room temperature. 1 quart of berries uses about 1/4 cup sugar - or as much as you like. 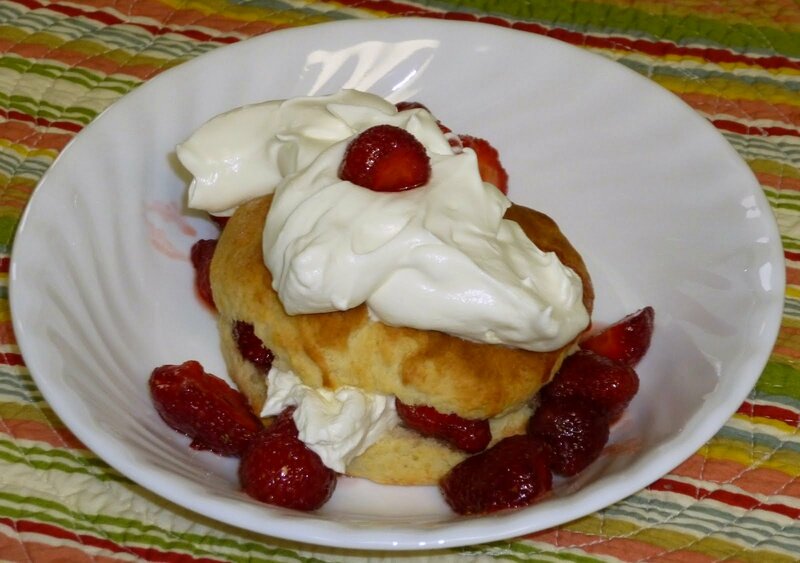 While the biscuits are baking, whip some cream for the topping. I use my Bamix electric stick blender to make this extra quick. Makes 2 generous servings. For dessert, this can be made into 4 cakes. Oh, Yes. The only way to eat strawberry shortcake. Not only is this the way we had it as kids, it is the way I also still make it.